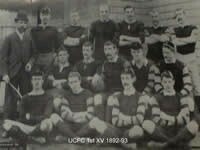 The year 1879 saw the foundation of 'The Club'. Unfortunately, there is no record as to the inception of 'The club' and it was two and a half years before any written records were made. The original title was Orion Football Club, but almost immediately, the words 'Upper Clapton' were coupled with the name 'Orion' and on the 11th March 1882 the title was changed to 'Upper Clapton Football Club'. After fifty years of playing on one field or another from White Hart Lane, Tottenham, to Bush Hill Enfield, The Club eventually found a permanent home in Epping, when it bought land in Upland Road and moved to Thornwood Common in 1933. In the beginning, the playing colours were blue, but after three seasons the colours were changed to black and amber. It was not until the 1900/01 season that Upper Clapton adopted their present red and white playing colours. Unique in that the 7" hoops are the only ones adopted by a rugby club in this country. The red, white, black and amber striped blazers first appeared in the 1930's. The fashion declined until the late 1960's when the pattern was rediscovered and since then the blazer has been in evidence at most major fixtures all over the world and indeed became the 'yardstick' for other rugby clubs to follow.